While we started this blog to chronicle our road trip, Aaron and I realized we still have stuff to say about baseball and beer. Some occasions demand documentation, and my experience last night at the Phillies game is one of those. I’m now regretting that blogs weren’t invented in 1993 at my very first playoff experience and that I didn’t write about the 1 1/3 games I attended last season. But baseball shouldn’t be about regret, it should be about living in the moment. The Phillies have proven that to me. I scored tickets in Section 133 to the 4th game of this year’s National League Championship Series. (My beloved Phillies have unbelievably secured a spot in the playoffs for 3 years now, proving that all I needed to do was leave New York and the Phillies could start dominating.) Given the price of these playoff tickets, it was not fiscally responsible for both Aaron and I to go. In his usual selfless manner he told me I should go. 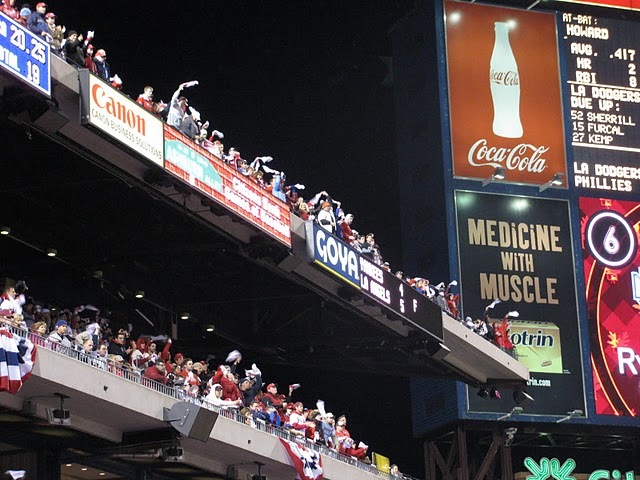 Not only because I wanted to, but because I’ve been to at least one post-season game every year the Phillies have made it this far since 1993. I have to keep the streak alive! So the extra ticket went to my brother Seth who values spending money on singular experiences. We were proudly raised as Phillies fans by Paul, our dad. I love telling the story that Paul’s dad brought home the family’s first TV to watch the Phillies in the 1950 World Series against the Yankees. Paul taught me how to keep score and trained Seth to read the strike zone. Paul’s also full of lessons and metaphors. The ones that stick with me most are often about baseball. We did have plenty of creative heckles for Manny Ramirez and his illegal substance suspension earlier this season. We had plenty of anger over bad calls at the plate and on a clean tag Utley made at second that was called safe. We also had a stand-up triple by Victorino, who ignored the crowd who believed he could only make it to second base, then the RBI that knocked him in, making it a one run game in the bottom of the 6th. We then had our typical late inning stress. Our pitchers letting guys on base, but not letting them score. Our team just not connecting. The night feeling longer in the cold, our legs tired from all the standing and sitting and standing, our arms sore from waving rally towels. There were moments in the 7th and 8th innings where I felt the stress silence everyone. We feared cheering. 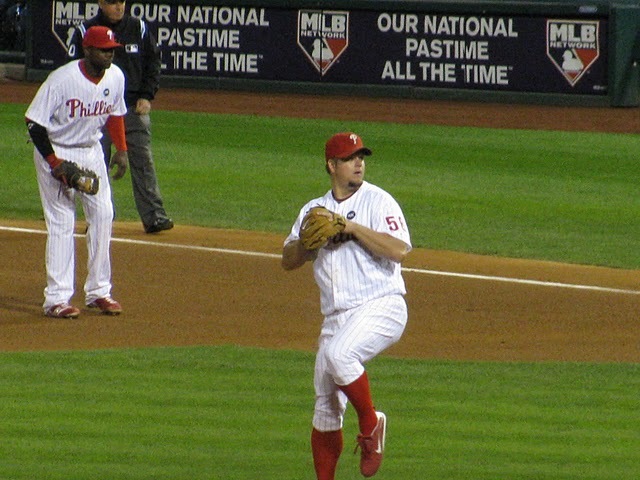 In the 9th inning, Brad Lidge reminded us of last season, as he got the two outs we needed, leaving us with a 1 run deficit going into the bottom of the 9th. Clearly, we’ve dealt with worse. By we I mean the fans and the players. Matt Stairs comes to the plate for Pedro Feliz. Stairs is capable of making this a tie game, but he’ll need a strike for that. Instead, he gets 4 balls. Carlos Ruiz, our mom’s season favorite and everyone’s post-season hero, comes to bat. This could be his moment! Instead, he’s hit in the elbow and takes first. We know he is the winning run, but Greg Dobbs doesn’t do anything about it. 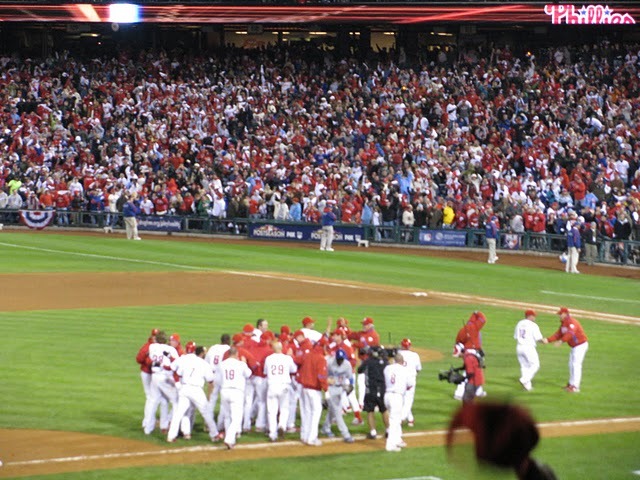 Instead, Jimmy Rollins comes to the plate with two outs. As the strikes show up on the scoreboard, Seth says to me “This will be really depressing if they lose.” Echoing the encouragement that Paul can summon when he needs to, I respond “Don’t say that until it’s over.” Seth conjures some optimism to point at a hole in right field. And in that moment, the ball is there. Jimmy hit it there and Ruiz is running fast enough to make it home with no problem. I can’t tell if I actually saw past 29 rows of fans to see him cross home for the win. Either way, I know we are all high-fiving and hugging, our friends, strangers. We treat every win like it’s the big one. We don’t take for granted that this is one more step towards what could be a rematch of the 1950 World Series that Paul watched with his father as a toddler. And in this moment, one of Paul’s recent revelations about baseball is even more appropriate. Let me see if I can paraphrase him correctly. He told me that the great thing about baseball is that everyone gets the same amount of chances. If you have a lead, you can’t run the clock down or play keep-away. You have to pitch to every batter. In this way, baseball is the most fair and equitable sport we have. And shouldn’t life be like that? Well I feel like it’s our turn to experience what it feels like to be winners. Sure, we’ve just won a title, but we deserve for it to not be a fluke. The only way we’ll know is if we play every out like it could be the one that wins the game. And the only team that does that is my team. My family’s team.